The Finsih Line Grease Gun is great for delivering measured amounts of grease where you need it when lubricating pedals, hubs, bottom brackets, headsets, and crank bolts. 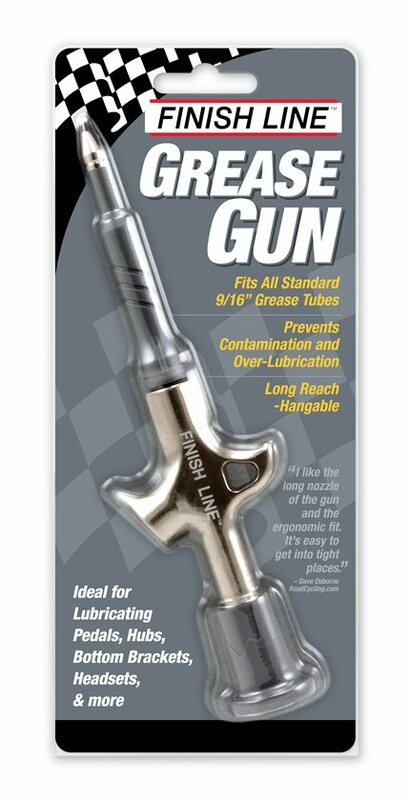 The gun is compatible with Finish Line's 3.5oz Premium Grease tubes and 2oz Ceramic Grease tubes. It also fits most other standard 9/16" threaded tubes of grease. Works as advertised, distributes small, even amounts of lubricant. Much better than squeezing out a large pile. This is a necessity for getting grease into grease ports such as those for pedals. Nice to have the long reach for those places that are recessed. I bought one of the original grease guns offered by Finish Line almost 16 years ago. I wore it out. This replacement is so much better than my old gun I wish I had replaced it ten years ago. I used to have to transfer grease, anti-seize or assembly compound from the tube into my grease guns. Grease guns will last forever but the hassle of squeezing, removing the air, squeezing, removing air, tightening, drawing a vacuum and finally applying was wearing thin. If you want to change greases you end up with a "mixed" grease for a while. This tool changes that. Buy a new tube of (insert product here), unscrew the tool, screw on the tool, draw a vacuum and apply. As long as the tube is intact, you can get every oz. of product out. The metal threads of this tool are forgiving enough that even if I cross thread the plastic top of the tube it will bite and create a seal. Product is quality and delivery rate is adjustable to individual mechanics and products. Another quality lubricant product from Finish Line. Gets grease where it's supposed to go. I have used Park grease for years, and always just squirted a glob near where I wanted it to go, and then smeared it around with my finger and wiped off the excess. The Finish Line greased gun provides a thin, controlled amount of grease, exactly where you want, and not everywhere else. Less smearing with my finger and less waste. I just leave the tube attached to the gun and keep it in my toolbox for regular bike lubrication. It's much easier to use the grease gun instead of your finger or a tooth brush. Fits directly onto smaller grease tubes. The grease gun is easy to fit to a tube and comfortable in the hand. I do find I have to work the grease sometimes up to the top of the tube but this may be normal as it's the first gun like this I've owned. I use it for my frame, an older fork I have, and misc jobs. It leaves a very thin line so you wont over grease. Would have appreciated if the return shipping would have been covered by seller. Buy it, use it, and go find something else to lube. Does this work on the zerk fitting on a santcruz lower link? Will this work on a 3oz tube of Phil Wood waterproof grease? BEST ANSWER: I just gave it a go since I have those two items, and it works! It's the same thread.